When you learn another language, you learn a foreign mentality. After years of practice studying another language you gain a sense of the customs, the culture and the mindset of the people who speak the language. The structure of a language, the idioms and written works all reflect the culture of the people that speak that language. An article in The Economist that discusses this topic states that “each language encodes a worldview that significantly influences its speakers.” With that being said, knowing another language can alter your personality and your thoughts the moment you speak another language. 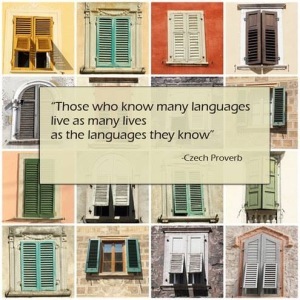 Putting this all together, knowing another language allows you to experience a different life in a different language from the life that you live in your first language. Perhaps even changing your thoughts and the way you perceive the world. In that sense, the more languages you know, the more thoughts and worldviews you will learn, and the more lives you will live. Sign up for spring classes at Sentieri and you will learn to live your life in Italian and live like an Italian!